As many pet owners likely know, cats are the animals that get all the credit when it comes to landing on their feet. However, one lucky Labrador from Falkirk, Scotland just proved that canines can be just as surefooted as their feline counterparts. This seven-year-old pup, Suki, fell from a vehicle her owners were driving going 70 mph on a fairly busy roadway, but, thanks to some sturdy legs, the miracle dog survived the freak accident with only minor injuries. She fortunately avoided getting hit by approaching vehicles and landed safely in a grassy clearing—or as safely as was possible. Suki’s owners, Graham and Sandra McGregor, are certainly counting blessings. 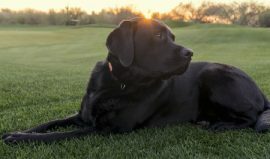 The McGregors were driving to London from their Scotland home, with Suki and their other Labrador, Sasha, in tow, when another vehicle started frantically flagging them down. According to Sandra, 60, “There was a car behind us tooting and gesturing, but I didn’t know what for…He then pulled up beside us and shouted that the boot was open.” The couple soon realized their BMW’s trunk door was open wide, and Suki was no longer in the vehicle. Terrified their dog may have just died, Graham pulled the car over into the shoulder and started running a mile down the highway, hoping against hope that she was all right. Surprisingly, the 62-year-old Graham found Suki, alive, lying in the grass by the roadside. According to the retired civil engineer, “It felt like the longest run I’ve ever had to make.” Despite Suki appearing to be fine, the McGregors wanted her to see a vet immediately just to be sure, causing them to abandon their London trip to spend time with family for Halloween. They rushed Suki to the vet and were told her back legs had sustained injury. According to Sandra, Suki is known for her strong legs due to the fact she’s been swimming most of her life, and pulling herself from the canal has likely strengthened the muscles in her legs a great deal. “She’s very different from Sasha, who is a bit calmer.” As to how the trunk door managed to get open, the McGregors have yet to find an answer. “We took the car to the garage to be checked, but they couldn’t find anything wrong,” Sandra said.